Every structure consists of the load bearing system which is usually constructed by reinforced concrete, steel or by a combination of those two materials. This book deals with building frames made out of reinforced concrete (RC). The structural frame might not be visible externally in the final stage of the construction but it exists internally and it constantly supports the structure. The structural frame is composed of horizontal and vertical load bearing elements as well as of foundation elements. 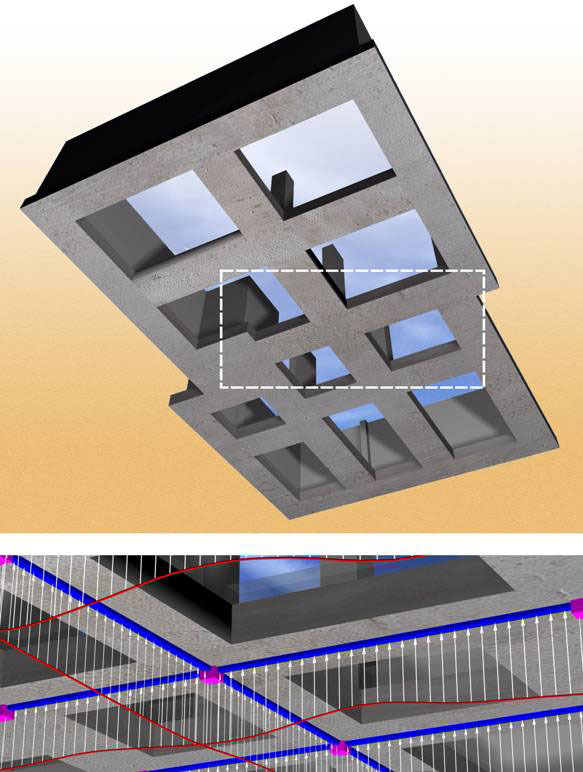 The following photorealistic figure shows the structural frame of the above building (the slabs of the upper storey have been removed in order to allow for the optical presentation of all ele-ments. The horizontal load bearing elements include the slabs and the beams. The vertical load bear-ing elements consist of the columns. 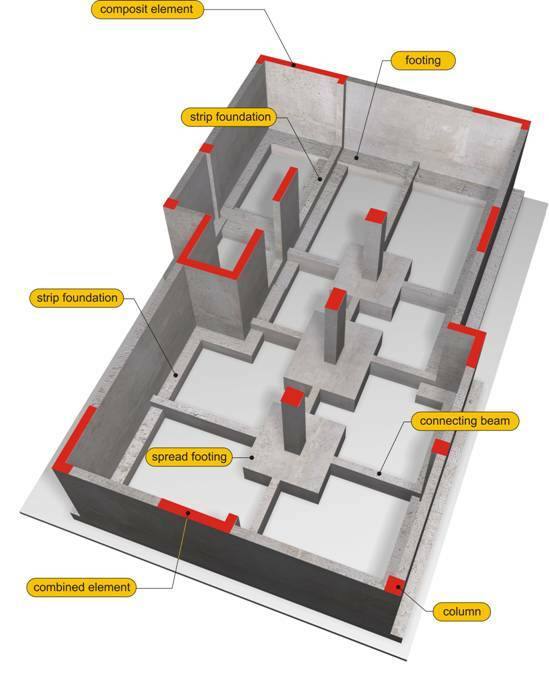 The following photorealistic figure shows the foundation of the building. The foundation elements of this building are the spread footings, the Foundation beams and the strip foundation. Other types of foundation may be the raft foundation (raft slab foundation) and the piles. The structural frame must have enough strength to securely bear the gravity loads throughout the entire life span of the building. An adequate load bearing system is based on a continuous load path throughout the structure. This means that the vertical loads must be carried by the slabs and transferred to the beams; the beams must transfer these loads to the columns which in their turn must transfer them to the foundation. Finally the foundation must carry the loads to the ground. The slabs carry the floor loads of each storey. These may be characterized as permanent loads (dead loads) i.e. marble floor covering and as imposed loads (live loads) i.e. loads ap-plied by human activities. The beams carry the loads transferred to them by the slabs as well as the weight of the walls seated on them. The columns carry the beam loads and they transfer them to the foundation. The footings (foundation) carry the column loads and transfer them to the ground. The foundation beams hold the footings in place when the structure is subjected to excess load-ing i.e. in the case of an earthquake or when differential settlements occur. In the following chapters it will be shown that all these structural elements may be found in dif-ferent forms than those mentioned above, however their behavior remains the same. In countries with extensive seismic activity like Greece, the structural frame must be able to withstand not only the gravity loads but also the loads imposed in a few but vital cases during its life span such as the cases of earthquakes. In a structure, the seismic action causes deformations and stresses in various directions. These are the stresses that the structural frame must withstand. Slabs are not designed to bear earthquake forces however they help in the even distribution of these forces by connecting the rest of the load bearing elements with their diaphragmatic action. Not all elements are critical for the seismic performance of a structural frame. For example dur-ing an earthquake, the column’s load-carrying capacity is much more crucial to the structural performance than the load-carrying capacity of a beam. This happens because the column’s failure may lead to the failure of adjacent elements like beams and slabs which in turn may lead to the progressive failure of other columns thus resulting in the total building’s collapse or in ex-tensive failures. On the contrary the beam’s load-carrying capacity loss leads to local area dam-ages which in the case of a major earthquake may even turn out to be favourable for the struc-tural stability. This is the reason why columns in earthquake prone areas are much stronger than the columns in countries with low seismic activity. In order to have a better seismic performance of structures, we should use columns with large dimensions but this would limit the interior available space. 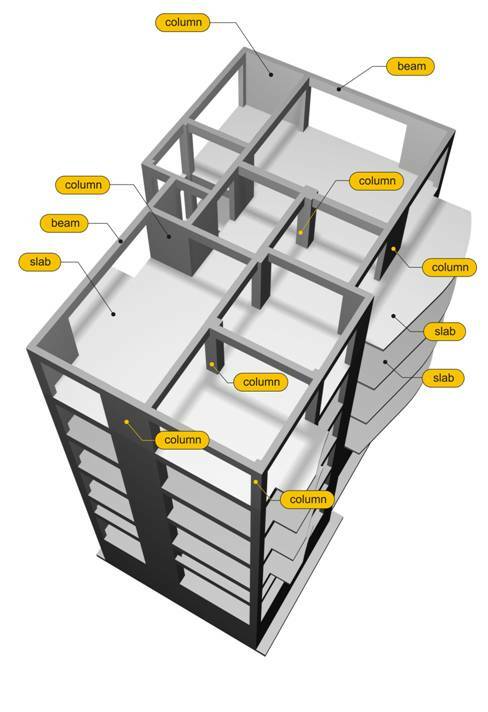 For this reason the use of large col-umns is replaced with the use of shear walls in both directions of the structure. The shear walls contribute not only to the compressive strength of the building but also to the increase of its structural stiffness thus limiting the displacements and consequently the deformations caused by seismic actions. When seismic design is required, the use of beam supported slabs is mandatory. In cases where due to architectural or other reasons, the beam height is not allowed to be extended be-yond the slab thickness, slabs must be thick enough to ensure the proper function of the beams with zones embedded to their thickness in the form of hidden beams. In multi-storey buildings, columns must not be discontinued in any storey; this means that a col-umn starting from the ground (foundation) must extend all the way to the upper storey of the building. 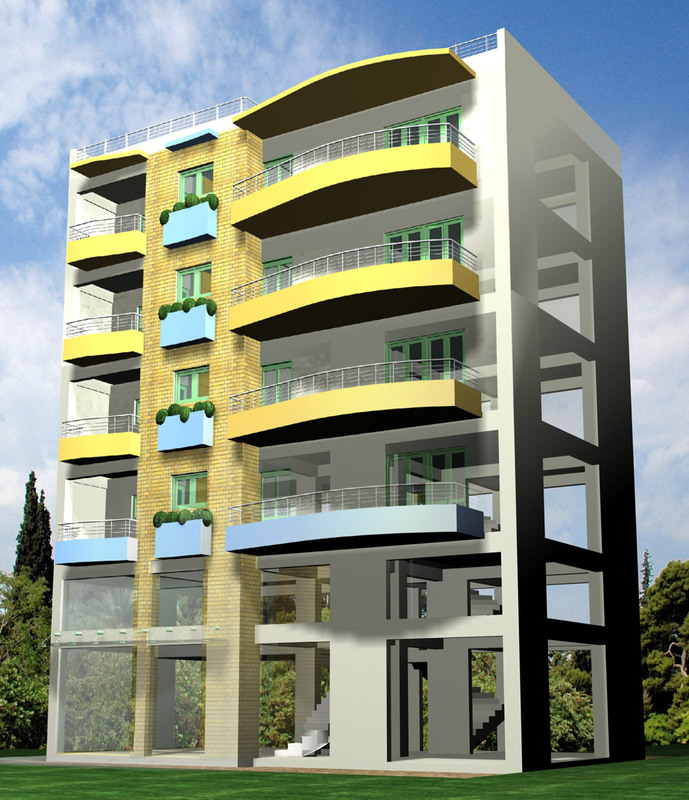 In Greece, such a column that terminates in an intermediate storey and not on the ground is called “fitted column”. Usually such a column must be supported by a beam (beam bearing column) since the Greek Code does not allow it to be supported by a slab. However, in order to maintain a good seismic behavior such columns must be avoided. Possible failure of connecting beams or footings, results in direct failure of columns. 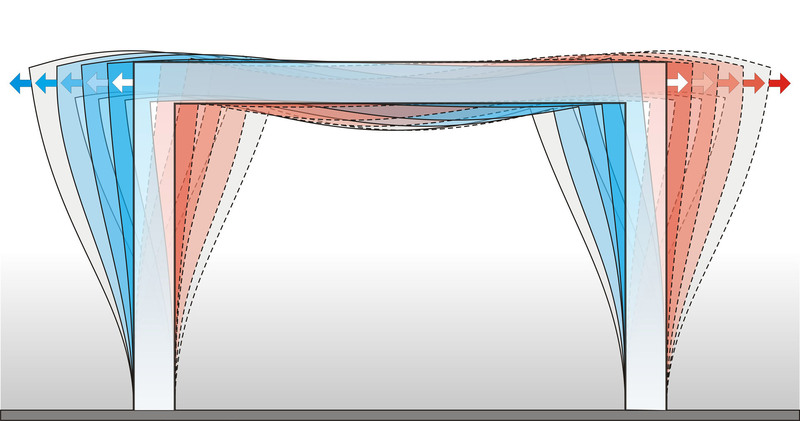 This results in beam failures, and finally in slab failures. Such a mechanism will take place in all storeys leading to a total building collapse. The construction of a basement and the use of shear walls along the perimeter improve the structure’s seismic performance. 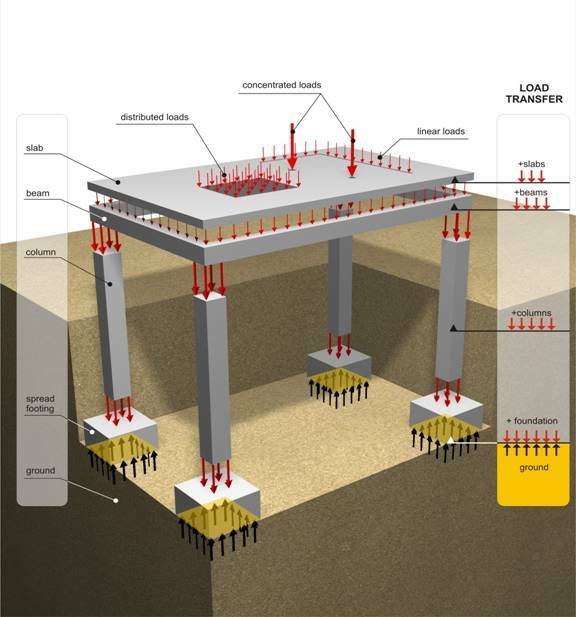 The use of continuous footings or/and the use of connecting beams helps the smooth “bedding” of the structure upon the ground and the limitation of differential settlements whose occurrence would have caused crackings to the superstructure. After their construction, footings are covered with soil rubble and by the basement floors, so they appear to be inactive. In reality they are active and they critically affect the structural be-haviour especially during an earthquake.